A breach occurred in the Bangor Waterworks Dam in 1978 which allowed Atlantic salmon to migrate unobstructed upstream as far as Veazie dam. This afforded some excellent fishing in the Veazie area and was taken advantage of by the few anglers who were aware of it. With the gleaming possibility that this opportunity would continue in the future, a group was called together in September of 1978 to form the Veazie Salmon Club. At the first meeting officers were elected and the beginnings of a charter were drawn up. The Club started with 25 originating members. Building funds were obtained primarily through the sale of lifetime memberships. Construction took place during the spring and summer of 1980. With a ton of determination, long hours and hard work, a dream became a reality. The building was dedicated on September 6, 1980. 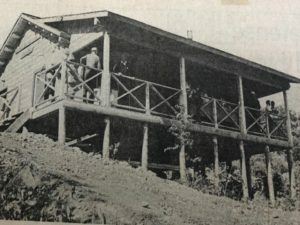 Since that time numerous improvements have been made that include hot top, installation of a septic system, and expansion of parking and a walkway to the river. The Veazie Salmon Club is an iconic organization once a focal point for over 350 members who shared respect for the Atlantic salmon fishing traditions. Club traditions extend much farther than just fishing. Fishing is a common bond. In addition to the promotion of fishing and environmental stewardship the Veazie Salmon Club will provide the community and surrounding region with a place to come appreciate Maine’s Penobscot River along with understanding what many famous people traveled from around the world to experience. The membership is extremely proud of the Veazie Salmon Club and extends an invitation to visit, sit on the porch, and enjoy the spectacular view of the Penobscot River as well as some of the fishing activity.